The "new" capital, only a hundred years old or so; the central citadel, hewn out of the rock underneath an impenetrable azure dome of Bieth manufacture; divided into the Round City and the Cinnabar Flats by a moat of quicksilver; . Taste: Judhaab - Chicken on top of an apricot pudding. The dish of kings (or at least of Caliphas). 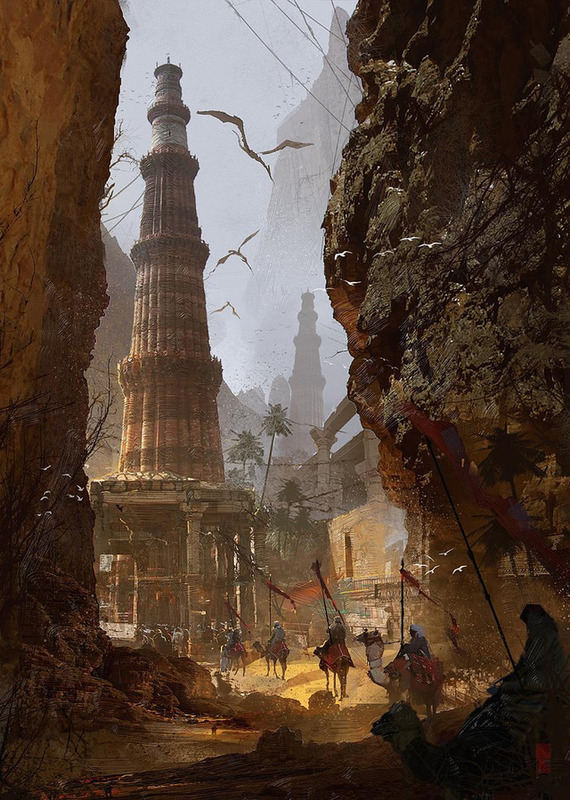 The heart of culture, refinement, taste; cities tottering into decrepitude; ancient dynasties of nobility stretching into the sands of time; the most fearsome heavy cavalry in the world; lamia matriarchs – peers in the nobility – engaged in shadow wars of intrigue. Ancient coalition of city-states brought into the Caliphate; tercios of spears and matchlocks; mud-brick buildings; home of gold, copper, salt, and powder; the bones of the giant Zulkarn forming the basis for the engineering academy of his name. A thousand tribes, wandering and warring; light cavalry honed from time immemorial; shamanic battles bringing down elemental fury for miles around; a continuing web of blood feuds and debts of honor; rituals to meld rider and steed into centaur. Clark Ashton Smith Story: None! 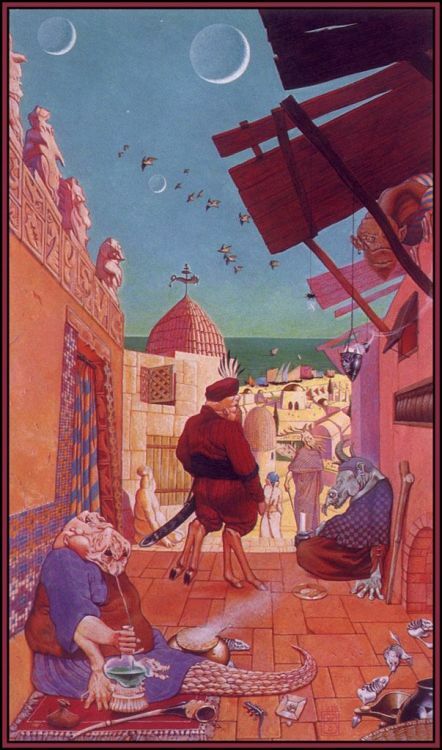 Try an El Borak story by Robert Howard instead. Heavy cavalry to rival Turan, but quilted armor rather than steel cuirasses; contains the Well of Souls, where the dead can be heard awaiting the Day of Judgment; politically on the rise after the Calipha's marriage to Prince Bey Ajidda; rolling savanna and light forest; home of the Verdant Order, devoted to following the example of the Man of Green, servant of ar-Rahman. The extent of the Caliphate's control on the frontier, built atop the ruins of a Bieth underground complex; dedication to quick money, easy profits, and wild schemes; criminal fixers called "crows" organizing expeditions to delve beneath the surface or into the borderlands; the Steel Hand, vigilantes sworn to prevent Bieth relics from endangering the city; home to the exiled, the charlatan, the unwanted, the fortuneseeker. 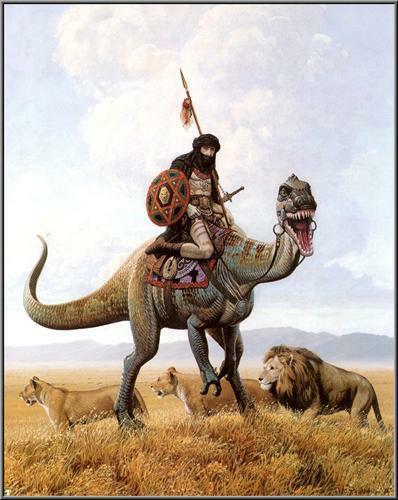 The back end of the Caliphate; heretics and priests of the Many exiled to wander in the desert (or the Zone); metal lions stalking the wastes; ever-smoking ruined war machines; dry hopelessness or grim fatalism; warlords vying for control of five ancient fortresses, horrid mutated beasts crawling forth from the badlands. 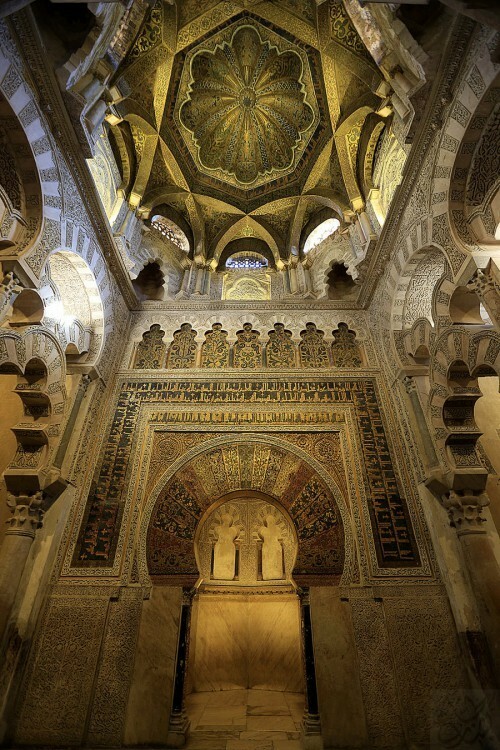 Urbane urban centers now falling into genteel disarray; former capital of the Caliphate; rolling farmland; rumored schools of dark sorcery; perennial uprisings of the Creed Sanguine; assassin-poet societies; sleeping in the tombs of your ancestors to gain sacred dreams and guidance. 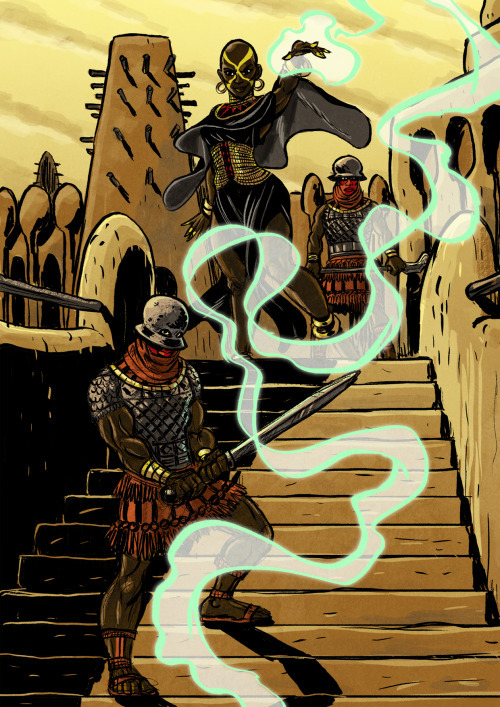 Without a veil or facemask, you may as well be naked; salt-marshes and salt-witches; unbreakable infantry of iron who ritually dance to prepare for battle; home of the nusr war-lizards, used as light cavalry. An allied city-state that houses the Caliphate navy; ruled by the ritually-blinded Fortunate Sheikh; each season a new expedition is launched to open trade routes and explore new lands - they (usually) return home in good order.